I’ve finished recording the audio version of the first episode of Flight from Hell and I’ve sent it off to the Big World Network. Meanwhile, I’m writing episode four, which turned a bit surreal on me. Novels do that, I think. Surprise you. You think you have stuff figured out and then there’s this extra bit of richness or of fun lying about, ripe for the writing. But one night I was bored and I felt like typing a bit of crazy, a bit of oppressive atmosphere, a bit of sharp bitterness against the world. Unkind characters and a hostile universe, things going wrong even when they go right, beauty found in bleeding and in pain. Flight from Hell was meant to amuse me during a sleepless night, but since I liked the idea of publishing I sent it off to the Big World Network, alternately telling myself that it would be the best thing they ever published and the worst and most unfitting story that’s ever been sent to them. Sometimes I feel like I need narcissism to get read, megalomania to withstand the onslaught of criticism, masochism to read suggestions for improvements. Otherwise I’ll only remember that outside of me there are written worlds so beautiful that they make me cry and I’ve never managed to get to that point. The crush would be too great, so I do declare myself brilliant. I must be. 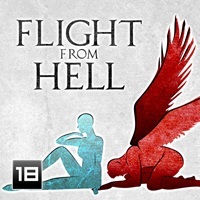 Episode four of Flight from Hell is surreal and I’m letting it carry me around. I know where it must end (perhaps that particular bit will end in episode five, if I can’t squeeze it all in ten pages), but the road there can wind any way it likes. I’m having fun with ideas, alternately putting them on the page and washing them away, remembering what little things need to be in there and editing them in or out, spinning them around until they look like they’ve always belonged. Which they did, I suppose. Stories are marvelous that way. By the time you write them to the end, they will have always been meant to be that way. What fascinates me is that I’ve always known Sara. She was around long before this novel, doing things, fighting, failing, trying, loving, broken, going on. I know what she thinks, I know who she is. I know what she thinks of Nakir, of this angel she chose for a companion, of Hell, of escaping, of herself. I know her fears and desires and motivations, the whole bit. I thought at first she’d be the one lending her voice to Flight from Hell, but Nakir took over. I’m just getting to know him – and he barely knows anything of Sara, but he’s watching her from behind, guessing, thinking, speculating, judging. I’m writing what I don’t know, against that silly advice of writing what you do know. Where would you be, if you always did that?… Spinning around in circles, that’s where I would be. No, exploration is the best way to go, the way I see it. I can’t wait to see it published. And I’m curious about what cover they’ll come up with, what little song bit before the audio version of each episode. I have no talent for visual arts, no idea what I’d want as a distinctive sound. I’m waiting to see those to figure out what others think Flight from Hell is like, to see what they see it as.